But you gotta understand … I’m a Mets fan, which meant that for six games a year (except for last year and this year, when it was four games, and 2000, when it was 11), I hated him. And don’t you dare mention the 2000 World Series, if you want to breathe right. But the fact is, I could hate Jeter only for six games a year, because Baseball. Baseball is why America is worth fighting for, and for 20 years, Derek Jeter has been everything that’s right about baseball. And that’s why I am so disappointed with a TV talking head I normally love to watch, a guy who almost always gets it right and who I wish would (could?) return to commenting on general news and politics, if he could just find a news network that could deal with his, uhhhh, eccentricities. We’re talking about you, Keith Olbermann. Keith, everything you said was accurate. And it was so very wrong. And as a guy who loves baseball, you should know that. No argument there, Keith. Not on a team that has had the Iron Man and DiMag and Mickey and Yogi and Reggie and Whitey and A-Rod and, ummmm, oh yeah, some guy named Babe. Hell, Derek never even won an MVP, as you were so eager to point out. So in that sense, Keith, you were “right” . . . Derek is not by any measure No. 1. 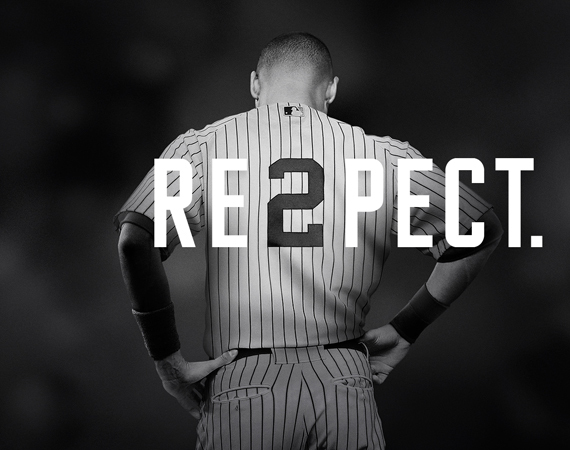 For 20 years, Derek Jeter, wearing No. 2, has been everything that’s great about the greatest game on earth. On the field, he’s been the guy you took your kid to the ballpark and said . . .
Keep your eye on that guy. Watch him. Follow his eyes. Try to get into his head. He’s in the game on every pitch, in every inning, in every game of every season. And off the field? Keep your eye on that guy. He’s a mensch. Don’t know what a mensch is? As Casey would say, you could look it up. But these are the Pinstripes. It’s hard to play 20 seasons on the most famous team in sports, with an egomaniacal owner, in the biggest city with the most difficult and demanding press in the world … and never lose your cool. Note some of the names who are not on my list: Mickey, Joe D., the Babe, A-Rod. No. 2 was never baseball’s No. 1, its leading man. But by reputation, and for the purpose of competitive authentication, Jeter was the sport’s most essential or ambassadorial player in times of scandal and scorn…. [W]e have a generation of shortstops — from Colorado’s Troy Tulowitzki to Boston’s Xander Bogaerts, with more to come — who wear No. 2, who apparently always got what the stat geeks and the Jeter critics did not. A printout doesn’t tell you what is inside a player’s head and heart, nor does it measure how he fits into or affects the fabric of a team. Now you tell me, Keith … Who do you want your kid to idolize? Who do you want him to grow up to be – A-Rod or Derek? Barry or Derek? Roger or Derek? I’m going with No. 2. You want to play baseball, son? Keep your eyes on No. 2. Play like that guy. This entry was posted in Baseball, In the News, Sports and tagged baseball, Derek Jeter, harvey araton, keith olbermann, No. 2, Yankees by stephenbromberg. Bookmark the permalink. Always interested to hear what you have to say, Steve, but in the future, maybe use just one Keith Olbermann clip. My oh my is he longwinded.